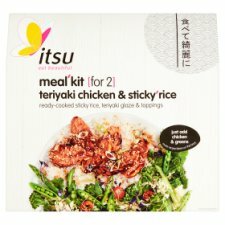 Teriyaki chicken is Japan's most loved sweet & sticky chicken dish. Teriyaki, 'teri' meaning shiny glaze & 'yaki' meaning fried, refers to the Japanese method of cooking meat or fish in soy sauce & mirin [sweet rice wine]. Store in a cool, dry place. Once open, use all ingredients., Best before: see back of pack. Cooking instructions for guidance only, cooking appliances will vary. Please ensure food is cooked until piping hot. Do not reheat once cooked. Do not microwave sachets. Cut the chicken into chunks & slice the spring onions on separate boards. Heat 2 tbsp of cooking oil in a pan over a medium heat. Add the chicken & fry until cooked through. Pour off any excess liquid. Add half the teriyaki glaze, increase the heat & continue to fry until the sauce begins to thicken. While the chicken is cooking, stir fry your vegetables in a separate pan or wok. Pierce the film on the rice & microwave for 2 minutes at 800W. Peel back the film & use a fork to break up the rice. Caution: steam will be hot! Plate up & pour the remaining teriyaki over the chicken. Drizzle the sesame chilli oil over the vegetables [to your taste], then sprinkle with the crunchy topping & sliced spring onions.